KATHMANDU, Dec 19: Protests against the government's move to revise federal boundaries of Province 5 have paralyzed various districts of western and mid-western regions of the country on Sunday. However, protestors have recalled banda in few districts, including Pyuthan. Agitating parties withdrew strikes on Sunday evening after intense protests throughout the day. They had been staging protests against the border delineation since the past three weeks. “People from every nook and corner have been participating in the mass protests. Despite prolonged protests, the government has been turning deaf ears to our demands,” said Gyamuram Neupane, chairman of the district chapter of Federation of Nepalese Chamber of Commerce and Industries (FNCCI). Meanwhile, ambulance drivers took to the streets on Sunday to protest against the vandalism of an ambulance (Lu 1 Cha 2131) in Chauraha of Butwal on Saturday. They demanded safety of ambulance drivers. 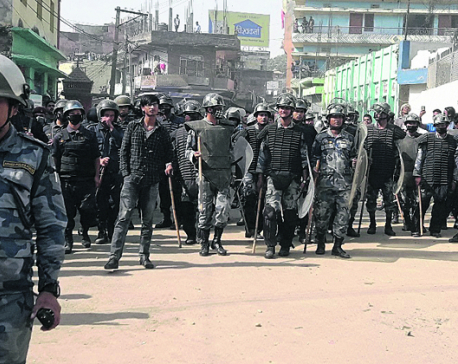 At least 24 demonstrators were injured in Gulmi after police intervened padlocking of the District Administration Office on Friday. Meanwhile, governmental offices, including District Administration Office (DAO), in Arghakhanchi district were forced to shut on the third day of the protests. Intense protests have made life of the general public very difficult as marketplaces, transportation, educational institutes, and industries in the district remained completely shut. Banda enforcers also prevented vehicles of press and ambulances from operating. Hundreds of protestors gathered in Sandikharka and Chutrabanshi Bazar and finally conducted sit-in in front of the DAO. CPN-UML district chairman Chet Narayan Acharya said the protests would continue nation-wide until the amendment is withdrawn. Mass protests have continued in Banke district as well. Locals have been staging demonstrations against the government's constitution amendment bill since the past three weeks.